Bend space and time as part of your creative self-care! In this workshop, we’ll look up to the heavens and capture the beautiful night sky using watercolor and mixed-media. 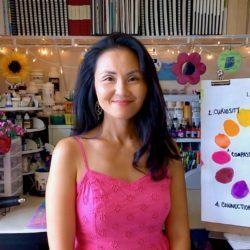 Gina will demonstrate simple resist and texturizing techniques to create illuminated moonscapes and enchanted forest scenes. Such landscapes will provide the perfect backdrop for art journaling and writing down our dreams. We’ll also paint and sew a full watercolor moon filled with sparkly elements and an angelic surprise. Includes liquid ceramic wax resist, decorative collage paper, china markers, transparency acetate film, iridescent sequins, feathers and the shared use of other supplies.